Becoming a Catholic - Interested in the Catholic? Not sure how to become a Catholic? You might be reading this page because you are curious about what is involved in becoming a Catholic, or because you firmly desire to join the Catholic Church. Either way, we wish to assure you that at no stage will the Catholic Church put you under any pressure to sign up and become a full member. In fact, you may find the process of becoming a Catholic somewhat slower than you would like… because membership involves making a firm committment to God and to the local Catholic community, and is not to be undertaken lightly! There are two sides to becoming a Catholic – receiving instruction in the faith, and taking part in the services of a local Catholic community. You can start with one or the other, but you will need to have completed sufficient instruction AND be attending regular services before you can become a full member of the Catholic faith. If you are seriously ill, the usual preparations can be reduced, and if poor health means you are not able to attend church regularly, the local parish can arrange for Holy Communion to be brought to you at home. If you desire to become a full member of the Catholic Faith, please do not let health issues stand in the way – your local parish will find a way to accommodate your circumstances. If you, or your current partner, have been married before, be aware that this introduces complications which your local priest will need to talk through with you. Jesus Christ taught that God’s plan for human sexual relationships was that one man and one woman should commit themselves to each other in a lifelong partnership, and for this reason the Catholic Church does not recognise that civil divorce ends a true marriage. However, the Church has its own rules about when a marriage “counts”. These rules are too complex to summarise here, but please assume that it is always worth talking to a priest about your personal circumstances to see what your options are. If you doubt, for any other reason, that the Catholic Church would welcome you into membership, please “Come and See”! The Catholic faith stands for high standards, but also for second chances. There is no person on earth who would not be welcome as a Catholic, as long as you sincerely aim to follow the teaching of Jesus as the Catholic Church understands it! The main Sunday service in a Catholic Church is called Mass, and at Mass we remember the command of Jesus to take bread and wine – “do this in memory of me”. 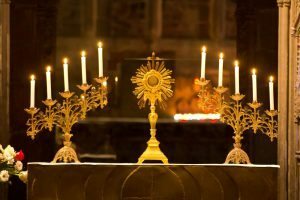 The priest repeats the Lord’s words, “This is my body, this is my blood” and as Catholics, we believe that the bread and wine truly become the Body and Blood of Jesus. The wafer and the liquid don’t change their taste or appearance, but we believe that what they are in God’s sight has fundamentally changed. No longer are they truly bread and wine, but rather the Lord’s own Body and Blood. 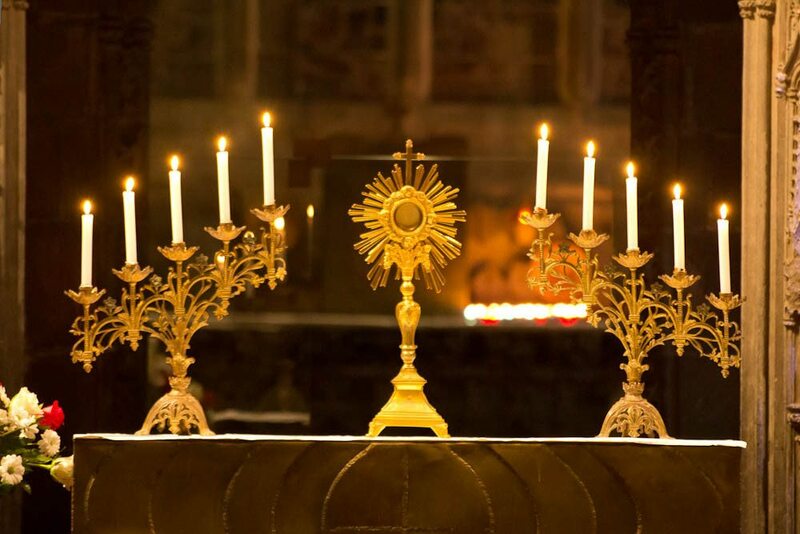 For this reason many churches also offer a kind of service called Adoration – the Body of Jesus is placed in a frame on the altar and members of the congregation come for silent prayer. Guests are welcome to attend Mass, Adoration, and all other services in your local Catholic Church. You might choose to try attending Mass before introducing yourself to the local priest or community. If so, be aware that there are lots of different styles of Mass – with or without music, using mainly Latin, or mainly English (in Cardiff there are also Masses in Welsh and in British Sign Language); some Masses have special provision for children. Please do not judge the whole Catholic Church on one single experience of attending Mass! If you do choose to attend a Mass without someone from the local community guiding you, in most parishes there will be some kind of prayer card or book available to help you follow the service and take part in the prayers. There is only one restriction: when Holy Communion is distributed, guests who are not yet members of the Catholic Church are asked to refrain from receiving communion: you may either remain in your place, or join the queue and come forward to receive a blessing, indicating this by folding your arms in the form of an X over your chest. Catholics in good health are expected to honour the Lord’s Day by attending Mass every Sunday, as far as practically possible (a Catholic ‘Sunday’ includes Saturday evenings). You don’t have to attend Mass regularly to join a group exploring what Catholics believe, but if you decide to become a member, you will need to have become used to attending Mass regularly. Many parishes offer a group where those considering becoming Catholic can gather together to learn more about the Faith. Smaller parishes may offer one-to-one conversations with the parish priest or a trusted instructor (“catechist”) from the local congregation. Through these sessions, you will learn about the teaching of Jesus as the Catholic Church has received it: teaching about God and about who human beings are in God’s eyes; the moral principles which God asks his followers to live up to; the ceremonies of the Catholic Church in which we worship God, express sorrow for our deliberate wrongdoing, and seek God’s healing in times of sickness; and the different ways of praying which are part of the Catholic tradition. There is quite a bit to consider, so the instruction can take several months, and often a year (sometimes more). If you have previously been part of a Christian Church, you will probably need less instruction, because you will know the basic message of Jesus already, but a mixed group of enquirers may need to travel at the speed of its least experienced member. If you have not already been baptised, the normal way of becoming a Catholic is to be baptised on the night before Easter Sunday. If you HAVE been baptised – and the Catholic Church recognises both adults and children.as properly baptised (Christened) if water has been poured on you “baptising you in the name of the Father, and of the Son, and of the Holy Spirit”, then you will be guided in making a confession to a priest shortly before the day (again, often the night before Easter Sunday) when you will be Confirmed as a Catholic and receive Holy Communion for the first time. Many parishes might call their Instruction Group RCIA – Rite of Christian Initiation of Adults. Strictly speaking, RCIA refers to the prayer services which are used to bless you at certain stages of your journey towards becoming a full member of the Catholic Church, but loosely it can also refer to the instruction sessions. You might want to start by attending a Mass, or by visiting an Instruction Group in a nearby parish. These often begin a new cycle in September, but you will be welcome to sit in at other times to get a feel for the sessions. Find a Parish in the Archdiocese of Cardiff (South-East Wales and Herefordshire) – or alternatively, contact us if you live in this area and we will arrange an introduction. Everything written above is a basic introduction. As you explore the faith you will discover the Church’s teaching is a little more complex – there are circumstances where Christians from other denominations can share Holy Communion; there are certain Holy Days in addition to Sundays when Catholics are expected to attend Mass. But everything written above is good for beginners!